Kolkata, India, November 23, 2017 – In his homily to about 150 Tibetans—sweater-sellers, students and monks—this morning, His Holiness the Dalai Lama remarked that he had been familiar with Calcutta since his childhood. Tibetans who had been to the city had described its sights to him. Then, on his first visit to India in 1956, he made he became acquainted with the city himself. “Since 1959, as refugees,” he told them, “we Tibetans have been able to reveal our culture to the world. Wherever we live, whether we’re in India, Europe, Australia or America, we have maintained our identity and shared in the spirit of being Tibetan. Those of us who live in the free world represent those who live in Tibet. I’m grateful to all Tibetans for keeping that spirit alive. 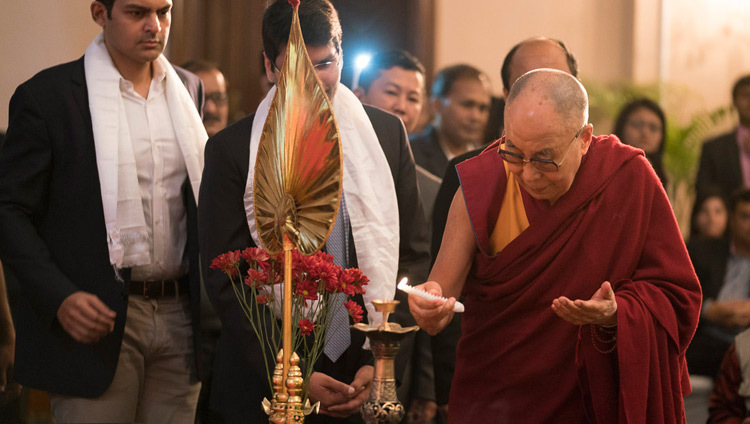 His Holiness emphasized the value of the Tibetan language as a means of accurately expressing the psychology, reason and logic of what the Buddha taught. He reminded his listeners that it is the language of the Kangyur and Tengyur, the body of largely Buddhist literature translated from Sanskrit. As he prepared to lead a simple ceremony for generating the awakening mind of bodhichitta, His Holiness explained that when it comes to the Buddha, Dharma and Sangha, it is essential to understand what the Dharma is. On that basis it will be possible to better understand the Buddha and the Sangha. He said that to understand the Dharma you have to have some idea what is meant by emptiness. Not just a nihilistic idea, what it means is that whatever exists arises in dependence on other factors and therefore is empty of intrinsic existence. This corresponds to quantum physics stating that things have no objective existence. His Holiness encouraged the students in the audience not to forget their Tibetan but to make an effort to keep it up. He recommended that they pay attention to Buddhist philosophy and psychology in an academic way, not necessarily from a religious point of view. Engendered by valid cognition, our faith in the three refuges will be firm. On this occasion His Holiness came to Kolkata at the invitation of the Indian Chamber of Commerce (ICC). An audience of 250 members and invited guests made him welcome. Once he had lit the inaugural lamp, he sat down to speak to them. “I always start my talks by greeting the audience as brothers and sisters, because that’s how I feel about all 7 billion human beings alive today. Each of us was born from our mother and then basked in her affection. That’s the seed that enables us to show affection to others. Scientists observe that our basic human nature is compassionate. As social animals, we all have a sense of compassion, but it tends to lie dormant. We need a sense of the oneness of humanity, a sense that we are all like brothers and sisters, to awaken it. As a human being, I am committed to encouraging people to appreciate this. “As a Buddhist monk, I am committed to fostering religious harmony. India is a vivid example that religious traditions can live together. Indigenous traditions like the Samkhyas, Jains, varieties of Hinduism, Buddhism and later Sikhism, have for centuries lived in peace alongside Zoroastrianism, Judaism, Christianity and Islam, which are traditions that originated elsewhere. “As a Tibetan, I have retired from temporal responsibility since we elected leaders in 2001 ns 2011. I have also put an end to Dalai Lamas occupying such a position in the future. Because the custom is related to feudalism, it’s out of date and time to change it. Incidentally, I feel the same about the caste system, the classification of some people as untouchable, while others are privileged. It too is out of date and undemocratic. It’s time it was changed. “Anyway, I am committed to drawing attention to the need to protect the natural environment of the Tibetan Plateau. This is of importance not only to Tibetans, but also to the 1 billion people across Asia who depend for their water supply on rivers that rise in Tibet. His Holiness explained his conviction that the world is facing a moral crisis. Many of the problems we face today come about because we lack moral principles—we lack compassion. One reason for this is that modern education is oriented to material goals with little time for inner values. He suggested that if we really believed that other human beings were like our brothers and sisters, we couldn’t let children die of starvation, nor stand by while people killed each other as they do today. He observed that knowledge of how to deal with the root of such problems by tackling our negative emotions already exists in this country. His Holiness places great hope on India’s ability to combine modern education with its ancient understanding of the workings of the mind and emotions. 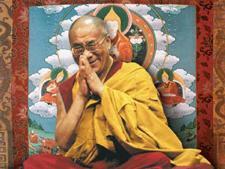 The audience smiled in appreciation as they applauded His Holiness’s words. His Holiness noted that in an increasingly globalised world, national boundaries have less significance than they did. He reported California Governor Jerry Brown’s telling him that national boundaries are nowhere to be seen when this blue planet is viewed from space. He reiterated his admiration for the spirit of the European Union, the placing of a common European interest before that of individual states. He cited the fact that, in a historical precedent, peace has prevailed amongst members of the EU over the last 70 years. Asked how to apply the Buddha’s advice in modern life, His Holiness recalled a conversation with a Swami in Bangalore in which they agreed that Buddhist and Hindu traditions have ethics, concentration and wisdom—shila, shamatha and vipashyana—in common. They may differ on their stance towards atman and anatman, but that is a matter of personal practice. Many Indian traditions involve an inner transformation that His Holiness has described as cultivating emotional hygiene. Whereas there is evidence that constant anger, hatred and fear undermine our immune systems, warm-heartedness and a compassionate outlook bring a smile to the face. After the formal words of thanks, His Holiness had a few final words for the audience. Shortly afterwards, having eaten a quick lunch, His Holiness drove to Kolkata airport to fly to Delhi, from where tomorrow he will return to Dharamsala.